This campaign was closed on May 19, 2017 and is no longer collecting donations. Utahns have questions about the Trump-Russia Connection. Why is Representative Chaffetz so afraid to investigate? What's in it for him? He dismissed our questions at his townhall. And then he accused real Utahns of being out-of-state, paid protestors. Let's chip in to keep asking questions and let him know he can't ignore real Utahns. Help us buy billboards in Utah County near Representative Chaffetz's local headquarters. We've done our homework--we have quotes and messaging approval from several local billboard companies to run the above billboard for 28 days. If we raise at least $2,700 we can put up a neighborhood billboard near his office. DONE! The first billboard is under contract and it's up now! You can see it here! For $7,400 we can do the neighborhood billboard and buy time on a digital sign on I-15 in Utah County. DONE! We reached this goal and will book time on digital signage this week--unless we hit the big goal and we'll get a premium sign! And for $22,900 we can get a high profile billboard along I-15 that will reach 70% of his strongest supporters! If you donate $25 we'll send you a sticker of the billboard--and if you step it up to at least $50 we'll send you a bonus sticker. To claim your sticker just email your shipping address to info@uwork4utah.com after you donate. We are a Super PAC called U Work 4 Utah and we believe in using modern fundraising tools in creative ways to persuade our elected officials to act in accordance with real Utah values, instead of doing the bidding of their donors, friends in DC, or dictators in Moscow. -Jason Chaffetz has announced his intention to increase his investigations into the Trump Russia issue, including issuing subpoenas. -A Special Counsel has been appointed to investigate the Russia issue, including pursuing connections with the Trump campaign. By any measure, our work together was successful far beyond expectation. Keep your eye out for more actions from our Super PAC. To donate to our Super PAC now click here. Your continued support will help us pressure our elected officials and remind them who they work for! Our first sign is UP! We did it! We all worked together and made the first sign a reality! Today on I-15 in Provo, just north of the exit to Chaffetz's Utah headquarters, we put up our first sign and it looks great. You can see a picture here, or follow us on social media! Here's a link to a Google Map of the billboard's location. We have already gotten some media interest and we expect more, so keep an eye out for media coverage of our campaign. We are in the process of booking digital signs at multiple locations along I-15 in Utah County, so stay tuned. We couldn't do this without your support so keep sharing and donating. If you donated more than $25 be sure to email us at info@uwork4utah.com with a shipping address if you want a sticker; stickers are shipping soon. If you want a sticker there's still time to donate so we can hit our max goal. There has been a slight delay due to printing and installation delays. We have been told the billboard should be up tomorrow. Will update as we hear back on the actual installation. Look for our sign on Monday! The billboard vendor confirmed that we are on schedule to have our billboard posted Monday morning 4/10! The billboard is on I-15, just north of the freeway exit of Chaffetz's headquarters. You will be able to read the sign if you are traveling north on I-15, between the Provo Center St. and University Parkway exits. Here's a Google Map of its location. Stay tuned for more updates as more signs go up! Keep sharing and donating. Thanks for you support! We hit our second goal! Thank you everyone for your donations, retweets, likes, and shares. Rep. Chaffetz will certainly hear us now. We are getting bids from our billboard vendors on digital advertising in Utah County. There will be no escaping our questions. We are getting a large billboard along I-15! One of our billboard vendors had a sign on I-15 become available and we got it for the price of the smaller sign! The board is just one exit from Rep. Chaffetz office and is available immediately. We will update you as soon as we can with specifics on when the board will be up. Please keep sharing on social media! We want to reach as many of Chaffetz's friends and neighbors as we can. Thanks so much to everyone for your support! As you know, we have raised enough money to put up our first billboard, and today we signed a contract with a billboard vendor to make it a reality! We want to keep the pressure on our friend Representative Chaffetz. Please keep sharing on social media to help us drive to our next goal of $7,400. When we reach our next goal we will get even more exposure with ads on high profile digital billboards along I-15 in Utah County, reaching as many of Chaffetz's friends and neighbors as we can. We did it! 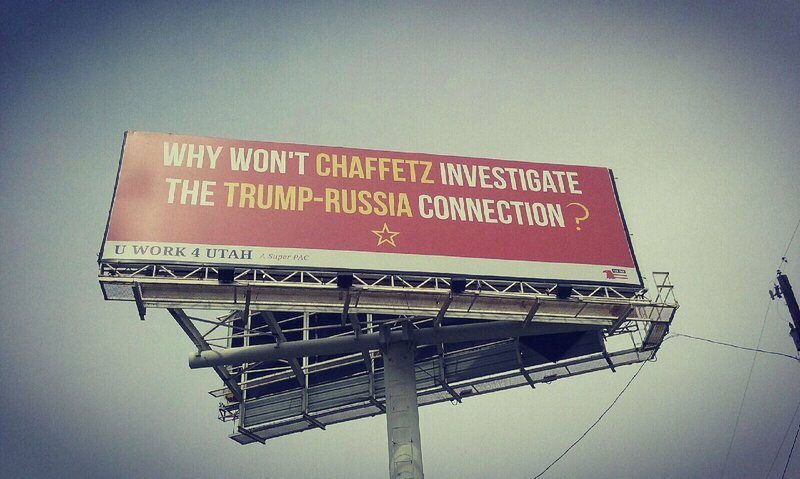 Together we've raised enough money to put a billboard right in Rep. Chaffetz's neighborhood asking the questions he continues to ignore. Thank you for so much support. We will begin the billboard production process immediately. Please, please, please, share this campaign far and wide. Let's get more people to pitch in and make a bolder statement with even more prominent billboards!